The results of this year’s Ballon d’Or are in. As expected, Barcelona players dominated the voting, with three current players and one ex-player in the top five. 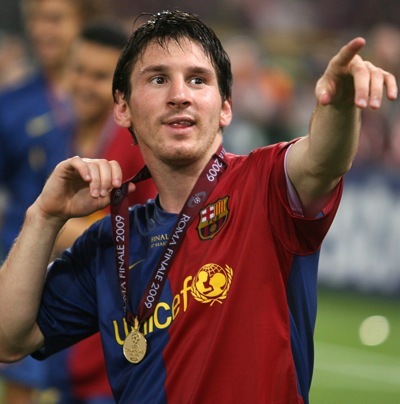 The greatest of these, and this year’s European Footballer of the Year, is … drum roll … LIONEL MESSI. It’s absolutely the right decision, though perhaps there was also a case for the award being given to Barcelona as a whole team, so outstanding were they in the last campaign. Cristiano Ronaldo was the only non-Barca player to figure in the top five. He came in second in the voting, but with less than half the amount of points (233) as Messi (473). A landslide for the little Argentine, then. Loving that picture of Messi, btw. And do you agree with the results? I think Zlatan is a bit too high. Other than that, hard to disagree much. I agree fully.. Messi is class..
also like the pic of messi.. funny!!! @ Reece – interesting list. I think Torres certainly unlucky not to be in top 10. Not sure Cesc merits his place there though. Top 20 maybe. i think Zlatan probably creeped up there with his incredible performances for barca this year even if he wasnt so good for Inter. If im honest i agree with the list apart from with Kaka who hasnt shone the same way in the past year. It’s a shame Piqué isn’t up there in the top 10, he has had such a massive jump in quality since he joined Barça. Considering Cannavaro did so well a few years back, defenders should start making it to the top 10 at least!